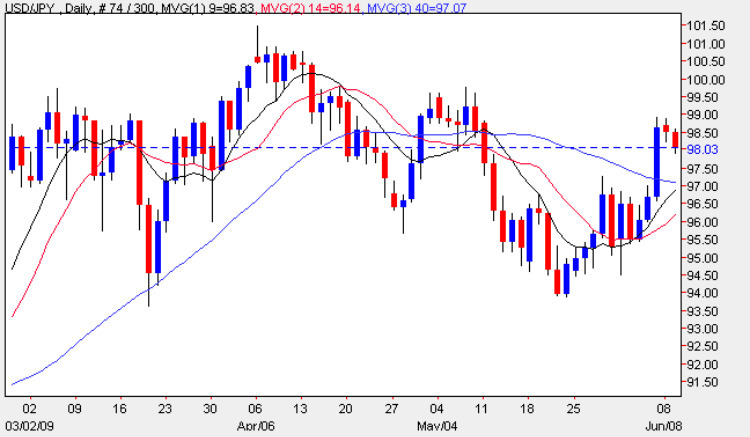 The yen to dollar pair continues it’s tortuous path sideways, ending the daily chart with a spinning top doji candle, suggesting a reversal from Monday’s wide spread up bar, which has duly been confirmed in this morning’s early trading session, with the pair falling back to the $98 price region once again. With all three moving averages converging, it is hard to draw any meaningful conclusions from these indicators at present, and despite the fact the we are now above all three, I have discounted this analysis for the time being. More importantly yesterday’s high failed to penetrate the strong resistance level immediately above, and as I have said many times before, until we see a sustained break above 102 to the upside, or a break lower below the $94 price area, then I would suggest staying out of this currency pair until we have some clear trading signals. As far as the fundamental news on the economic calendar is concerned, we had two items for Japan this morning, ( both minor pieces of data) namely the Leading Indicators, and Preliminary Machine Tool orders, and you can find further details on the economic calendar. Finally in the US we again have some minor news items which I have covered for you on the eur/usd site in more detail.